Yeah. Published by Rainbow Arts in 1987, it was pulled from shelves almost immediately due to pressure from Nintendo’s legal team, though one could hardly blame Nintendo for wanting to nip blatant copycats in the bud. Hard to find, it was widely sought after by collectors and few people knew about the game until game emulation via the internet began to sprout up in the mid 90s. 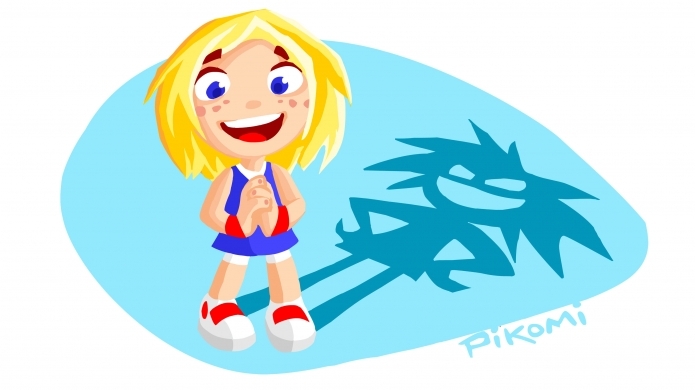 Over twenty years later, a new Giana Sisters game was developed and released (officially!) on the Nintendo DS in Europe, titled simply Giana Sisters DS. Oddly enough, it only features one sister, Giana, though perhaps one could consider her powered-up “punk” form as a separate character. 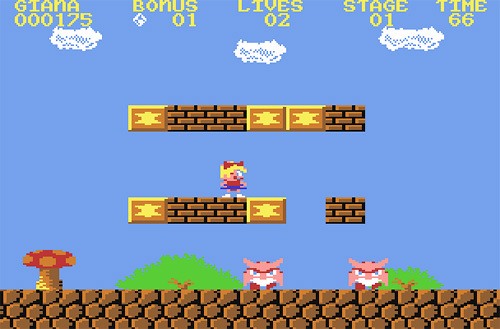 The game featured eight different worlds, filled with bite sized, yet at times tough levels filled with tiny platforms to maneuver and quirky enemies to avoid and defeat. The gameplay certainly won’t challenge Mario’s crown anytime soon, but it’s solid and enjoyable. The graphics are well animated and the characters all have cute animations to them. The music is very catchy and remenicent of the game’s Commodore origins, with a very chip-tune vibe to it. 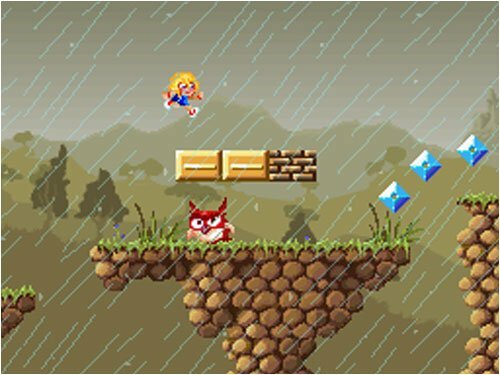 The game even features recreations of the original game’s levels, provided you find enough hidden gems to unlock them. Overall, despite it’s brief length and occasional cheap difficulty, it’s a great title worth playing. Despite growing interest of the title, it remained a European exclusive for years, as stateside release dates were announced and passed over. Even Nintendo Power reviewed the game in its February 2011 issue, giving it a 9 out of 10, yet no release was in sight. With the Nintendo DS in its last year of life, it seemed like importing the increasingly expensive title was the only option for those who wanted to play it. However, last month, the game was quietly released by publisher Destineer to several internet sites, such as Newegg.com, for the low, low price of twenty bucks. Seeing as how the game has yet to be available on more mainstream sites like Amazon.com, or even in normal brick and mortar stores, this game has the potential to become a collector’s item in the future, much like the internet store exclusive Electroplankton or Pokemon Box. Much like it’s original release. If you’re even remotely interested in this title, I highly suggest picking it up before it’s too late. Spent the last two and a half hours playing some Skyward Sword (spoiler: it’s frackin’ AWESOME), but I thought I’d take a break from the game and touch on a bit of history about that purple box that celebrated its tenth birthday last week, the Gamecube. While it was the least popular in terms of sales, it was always number one in our hearts (dawwwwwwwwwwww). It was a different beast than previous Nintendo consoles in many ways, but one way in particular in the fact that the Gamecube was the first (and to date, only) Nintendo console that had multi-game playable demos available in stores. Before that, store demo units were usually limited to one game, which was an obvious side effect of sticking with the cartridge medium. 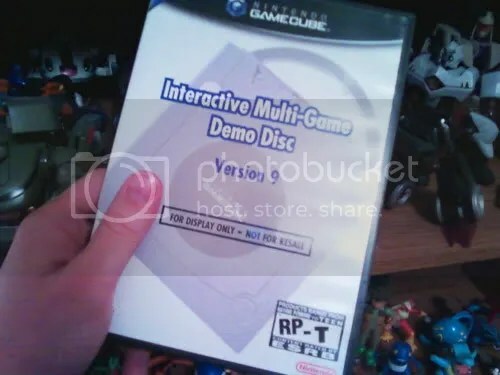 But with the Cube, we finally saw a change, as we saw demo discs with timed game segments consisting of anywhere between two to seven different games. There were even GBA demos that could be played via emulator, almost like a Gameboy Player or Super Gameboy, complete with a unique screen border! A few of the demo discs even allowed you to download data to your own GBA games, the most famous example being the “Berry Glitch” patch for Pokemon Ruby and Sapphire, which fixed a glitch and gave you a shiny Pokemon to boot. Fine. I’ve got thirty-one out of the thirty-five that were eventually released. I had friends in the electronics department at Wal-Mart, all right? Just don’t tell Nintendo, or they’ll take away my Fun Club membership. I won’t go into detail on all of them, so I’ll just pick one at random, Disc #9, which was released in late 2002. This volume contained two demo games for Metroid Prime and Legend of Zelda: The Wind Waker. Surprisingly, when I started up the Prime demo, it actually had an option for progressive scan! Impressive. The demo itself is pretty much just the beginning of the game, as you venture into the abandoned space station only to confront a huge insect like monster. Since the demo is limited to ten minutes, you really have to work hard to make your way to the boss. Still, this little demo is much more enjoyable than all of Other M. I kid! I kid! The Wind Waker demo features three different segments. “Dungeon”, drops you into the Dragon Roost Cavern, “Stealth” has you venturing into the Forsaken Fortress, and “Boss” pits you against the firey Gohma. The rest of the disc is filled with videos of Metroid Prime, Wind Waker, 1080 Avalanche, Wario World and Black & Bruised (a punch out clone that I’ve never played, actually), as well as an ESRB Ratings video featuring some baseball player. This was also the first disc featuring a new, flashier menu system, most likely in an effort to inform people that the Gamecube was not “teh kiddie”. There were many other demo discs released for the system, and some featured some interesting differences from the final retail versions that would appear, though through Nintendo’s typically odd way of distributing these discs, they were not easy to get your hands on and took a bit of work to obtain. But as the world slowly moves towards digital downloads, it’s nice to have a bit of history you can hold in your hands. You are currently browsing the Game Blog of AWESOMENESS blog archives for November, 2011.